The Cairo Historical Society’s Home Town Hero project recognizes the service and sacrifice of over 250 of our locally-born Soldiers, Sailors, Fliers, Coast Guards, and Marines. 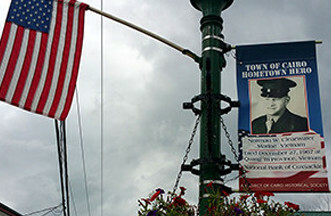 Street side banners provide a continual memorial throughout every hamlet in the town. Veterans from the French & Indian War to our most recent deployments are honored by family, friends and local businesses.